secure your product using stretch-wrap! We are decided to find you the cheapest supplier of Stretch Wrap Films. Our expert stretch wrap supplier can help you identify the most cost effective stretch wrap packaging that is the perfect fit for your needs. Stretch Wrap film offers excellent load holding force and puncture resistance, protects your goods during warehousing and transport, and reduces tampering. Whether you are a complete begineer or expert our information will answer your common question on strech wrap such as what is stretch wrap film, what are the benefits of stretch wrap, types of stretch wrap, should I use cast or blown film stretch wrap, stretch wrap packing tips, stretch wrap recycling and many more. Don't forget to look at our Buying Tips to help you source the right product at low price. Buy Stretch wrap film from industrie's leading supplier and Save the Money Now! Stretch wrap is a polyethylene plastic generally used to hold boxes on a pallet for transport. Stretch wrap is pulled around the load and stretched. The plastic has a memory and wants to return to its original size. Thus the "elastic band effect" holds the load tight. Stretch wrap is a plastic film usually made from high density polyethylene (HDPE), low density polyethylene (LDPE), linear low density polyethylene (LLDPE), and/or polypropylene (PP) resins. Stretch wrap is most often used to package products together for internal and external shipping. Warehouse/distribution centers, industrial plants, and large retail stores typically generate large quantities of stretch wrap. Stretch wrap is exceptionally strong, form fits to any item, and sticks only to itself, leaving no adhesive residue. Tired of drawers and cabinet doors flying open while moving your furniture? Simply wrap your furniture with stretch wrap and your drawers and doors will stay firmly in place. Wrap cables with your electronics, ski poles to skis, curtain rods, and table legs together. Better than rope for many applications, you'll be amazed at how many uses you will find for this stretch wrap. Large roll makes wrapping furniture and other bulky items fast and easy. Banding and bundling, a way to contain small items for shipping or storage with stretch film, eliminates the need for tape, string, strapping, and other conventional securing methods that mar product surfaces. Narrow width stretch film stretches more than the wider widths while still retaining much of its memory/recovery properties. This allows the stretch wrap to recover and form-fit the objects - tightly banding them together. Tape, string, or strapping does not continually provide the same form-fitted wrap that stretch film provides even as the objects settle. Better yet, stretch film does this without adhesives. No adhesives mean that there is no sticky residue left behind or boxes surfaces torn up when removed. Stretch wrapping is one of the most popular unitizing and pallet wrapping methods on the market today. The following lists some of the main benefits of stretch wrap. UVI stretch films can protect products stored outdoors from UV rays. 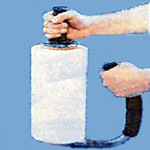 Stretch wrap equipment typically cost less than same caliber alternatives like shrink wrapping and strapping equipment. Stretch wrappers uses less energy to operate than other unitizing methods like shrink wrap systems. Stretch wrap films come in a wide variety of standard and special attribute blends to address many stretch wrap packaging application needs. Such as. Specialty stretch films examples: uvi stretch films, vci stretch films, heavy gauge films, roll wrap films, bundling film, banding film, wide web pallet wrap, vented stretch wrap, stretch wrap netting, pallet covers and top sheeting film, anti-static stretch wrap and more pallet wrap solutions. Cast stretch film also called cast film or cast wrap, is manufactured using the cast extrusion process. Typical characteristics of cast stretch films are: excellent optics, clear, glossy, superior tear resistance, quiet unwind, consistent cling and consistent film thickness. Cast stretch film products: hand stretch wrap film - cast, machine stretch wrap film - cast. Stretch film designed specifically to be applied manually is referred to as hand stretch film. It is also referred to as hand film, hand stretch wrap, hand wrap or manual pallet wrap. It is typically utilized in lower capacity packaging operations. However the efficiency of manual stretch wrap packaging should be regularly re-evaluated against potential benefits of upgrading to a machine wrapper. Choosing the right stretch applicator will result in more efficient and cost effective packaging operations. See products: hand stretch film - cast , hand stretch film - blown, prestretched hand film. Stretch film designed to be applied with a stretch wrap machine is referred as machine stretch film. It provides many advantages over hand film including: faster and more efficient packaging, reduced packaging material costs, safer application, more secure loads and more. Common machine stretch film types: cast machine stretch film, blown machine film and prestretched films. See products: machine stretch wrap film - cast and prestretched. Specialty stretch films are designed to answer very specific packaging needs that more general purpose stretch packaging solutions cannot accommodate. A small sample of some specialty stretch packaging films are below, each are linked to a product details page. Examine all applications of stretch wrap in the facility. Determine the quantity and types of stretch wrap being used, i.e., HDPE, LLDPE, LDPE, PVC and/or PP. Ask your supplier for data sheets on the film to be purchased. Note the quality of stretch wrap in the facility. Are there paper or plastic labels attached to the wrap? Is the wrap clear or colored? Is it free of dirt and grease? For each application, evaluate ways to reduce the amount of stretch wrap used in the facility. 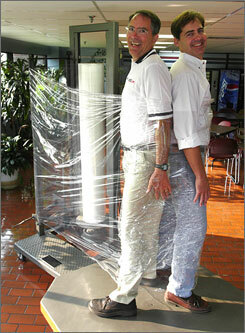 For example stretch wrap machines wrap pallets tighter and with less material. Pallet wrappers also can be trained to optimize film use. Stretch film is made from high-grade polyethylene resin that is extruded into a very strong thin film. The film is then slit into specific widths and wound onto thick cores for shipping to the customers. Originally, all stretch wrap was blown, a process much like blowing bubble gum. Resin is heated and passed over an opening through which air is blown. Most film today is Cast. It is extruded through rollers and "laid out" in sheets. this process allows the film to be made in multiple layers. the layers allow the film to be made with cling on only one side. this one-sided cling film is great where you don't want one pallet to stick to the one next to it. also, these film layers can make the film stronger by adding tough layers to the inside. cast film is also clearer and quieter coming off the roll. The following represent important criteria to consider when choosing a stretch film to meet your specific unitizing requirements. What is the required level of hold force retention? Will load require greater puncture resistance or tear resistance? Is shipping distance short or long and by what method? Storage conditions. Ex: If Long term outside, may need UV stretch film. Does product require a specialty stretch film? Such as: uvi stretch films, vci stretch films, heavy gauge films, roll wrap films, bundling film, banding film, wide web pallet wrap, vented stretch wrap, stretch wrap netting, pallet covers and top sheeting film, anti-static stretch wrap, etc. Will packaging operations require a quiet unwind film machine film (ex: cast) or very high decibels of noise is tolerable (ex: blown)? Is higher production speed, stabler loads and cost efficiency important? Will film need to allow scanning of bar codes or reading of labels? What size and gauge of film is required? What is the pallet /load profile (ex: height, weight)? Is the load profile type A, B or C? Easily calculate stretch film roll weight, roll length and film thickness conversion (micron : gauge). See stretch film calculator. Stretch film specifications for common machine film and hand wrap (microns per gauge, roll weights per gauge, case weights per gauge). See stretch film quick reference. Buy Stretch Wrap Film wholesale directly from the manufacturer & Save your money! Polybags Limited are manufacturers and suppliers of polythene bags, stretch wrap film and packaging products. They supply Clear or Coloured Stretch wrap. Low Prices on the internet and Free U.K delivery! Specialists in stretch packaging with great prices and discounts on clear stretch wrap, coloured stretch wrap and stretch wrap dispensers. Find the best suppliers and useful information about stretchwrap. Did you mean Shrink Wrap? Experts in shrink packaging with great prices and discounts on shrink film, wrap, bags and shrink guns. Everything you need to know to help you choose the best type of shrink packaging for your needs. The process of taking materials that are; fed, melted and or pumped in through other extruders, which are then merged to create a multi-layer film. When the stretch film is stretched, strained and / or deformed its ability to recover and return to its original form indicates its elastic recovery capacity. A testing means for measuring a materials ability to resist tearing forces. This method initiates a tear in a sample material, then measure to the amount of force needed to tear the sample apart. Test result value is referred to as the tear value. A manufacturing process that takes materials from one or more extruders, the resulting extradates are then configured to the fabrication of the end product. The speed at which the film is supplied to the load is the film feed. Film feed rate adjusts as needed on load corners to maintain consistent film tension. Is the memory of the stretch film trying to return to its original un-stretched form and in the process makes the load tighter and more consistently secure. This prevents loosening of the load that can occur later as the load settles. To achieve optimal film memory and film efficiency, proper film and application settings are essential. Also referred to as Machine films, is stretch film designed for stretch film equipment. New polyethylene resins developed using "Metallocene" change the polytheylene chain structures resulting in a new breed of stretch films. Metallocene stretch films can achieve increased puncture resistance and clarity while blends offer balanced film properties and universal stretch percentage applications (ex: machine film, hand film). Microns is a metric measurement used for measuring film thickness. One micron is equal to one millionth of a meter. Poly film covers commonly used to protect pallets from dirt, dust and/or conceal pallet contents. Tensile strength a measurement of the maximum amount of force a material can take without breaking. The greater teh tensile stretch measurement, the stronger the material. extra large boxes best for packing light bulky items -- comforters, pillow, etc. just don't forget they are there! fill remaining space with lawn sprinklers, small garden hand tools, etc. don't move paint, gas, or flammables! The majority of our customers who order stretch wrap call it shrink wrap and these are people who use the product daily. What hope is there for those who are not regular users of these products? And for that matter, who cares? Well if you need one or the other, you should care and just about every industrial, commercial or distribution company uses these products. The last thing you need is to order a product that won't work for your application, especially in these time sensitive days. These are two very different products used for very different applications. Let's clear up the confusion. Shrink wrap film is made from polyolefin plastic, while stretch wrap is made from polyethylene plastic. Shrink wrap is generally used to protect a single product, such as the plastic over toys at the toy store or CD's when you first buy them. Shrink wrap gets its tight seal through a heating process. The product is wrapped and heated with a hairdryer-like tool or put through a heat tunnel. Shrink wrap can also be used for bundling products together, such as bottles of soda. In some cases, shrink wrap is used for palletizing although it is far less common that stretch wrap for this application. Stretch wrap is generally used to hold boxes on a pallet for transport. Stretch wrap is pulled around the load and stretched. The plastic has a memory and wants to return to its original size. This "elastic band effect" holds the load tight. Generally stretch wrap comes in 12', 15' and 18' sizes for hand wrapping and 20'-60' sizes for machine applications. Shrink wrap is available in most even number sizes between 4-20' and is generally 'center-folded', that is the film is folded over itself to form two layers. The product is inserted between the two layers and sealed on the remaining three sides, then shrunk by heat. Shrink wrap is a packaging technique where the plastic film is wrapped around a product and heat sealed to form a loose envelope. It is then heated all over causing the wrap to shrink more or less tightly around the product. Stretch wrap is an elastic film that is mechanically stretched around the product like a wide rubber band. It is not heat sealed but relies on a self adherence - so it is applied in plys; overlapped on itself. To visualize the difference, a toy or a box of software might be shrink packaged. You can see the line of the heat seal that was made before the shrinking took place, but the print on the product is clearly visible through the film. The film is clear and relatively slippery. On the other hand, a pallet or skid of boxes is stretch wrapped. A stack of shrink wrapped boxes of software might be stretch wrapped. The film used is a lot like, if not identical to, the household wrap which we use to call "saran wrap" ( it's usually not saran anymore). It is clear, but many wrinkles occur where the film overlaps itself so it is less appealing aesthetically. Stretch wrap is therefore more of a shipping tool, while shrink wrap is more to keep a product clean until after it is in the hands of the customer. There is lot of overlap in the function of the two products. Shrink wrap is also used to package cases of dog-food and other products shipped in bulk where the package is opened at the market and is not seen by the customer. Stretch wrap is used more and more to unitize small bundles for shipping. Shrink wrap is an older technique preceding stretch wrap by more than 10 years. Before stretch wrap was used, shrink wrap performed many of its functions. It was soon discovered that stretch wrap was better than shrink wrap for heavy duty industrial packaging since it was no less effective and cheaper and easier to use. Shrink wrap is energy intensive since heat must be produced to shrink the film. The shrink machinery usually requires more maintenance since heat sealing of the film is necessary. Stretch wrap film is designed to adhere to itself ( no adhesive is used though), The film has a high coefficient of friction. It can prevent a package from sliding when a stack of product is handled. The prevention of sliding may not be an asset when the high friction creates handling difficulties for people, or sliding difficulties for certain types of machine handling. For 'point-of-sale' where the wrap has to sell the product - usually by not being in the way visually - rather expensive, special, oriented films are used. These films are very clear. When they shrink, they do so with alacrity, exerting energy on the product and shrinking with few or no wrinkles or distortion. This is hi-tech packaging where the film can be pre-printed with appropriate distortion so that the printing comes out perfect after it shrinks. Industrial shrink packaging, on the other hand, is done with more ordinary films which are less costly and shrink,when heated, in attempting to regain the form it was in, in; or on its way out of; the extruder. The purpose of this guide is to encourage and promote the recycling of a product commonly used by distributors in a wide variety of industries ' stretch wrap. Stretch wrap is most commonly made of linear low density polyethylene, or LLDPE. Most of us know it as the material that secures pallets of individual containers. Pallet stretch wrap is used by product manufacturers and distributors to bind shipping cartons to pallets going to a warehouse/distribution center (W/DC). It is also used at the W/DC to wrap pallets sent to outlets/customers. This guide takes you step-by-step through the design and implementation of a stretch wrap recovery program ' from locating markets and developing a collection system to assessing how a successful stretch wrap recovery program can affect your bottom line. The guide is targeted primarily to firms with one or more W/DCs where products are received from manufacturers and then distributed to downstream outlets/customers. The fundamentals should assist any location receiving and unwrapping stretch film from pallets in developing a viable stretch wrap recovery program. Four case studies have been provided to demonstrate how a stretch wrap recycling program can be adapted to meet the needs of a given organization. Stretch wrap is one of the largest components of a W/DC's waste stream. Those that do not recycle stretch wrap must pay to have it hauled away with the rest of the trash and disposed. A large W/DC can generate thousands of pounds of stretch wrap per year ' and that carries weight on the bottom line. Recycling stretch wrap offers an attractive alternative to disposal. There are ready markets for clean material and many firms are especially interested in working with businesses. Also, stretch wrap is relatively easy to identify and recover. It arrives at the dock in a fairly clean, uncontaminated state. If kept that way, it has real market value. In fact, pound for pound, stretch wrap may be the most valuable scrap material a W/DC can recover. 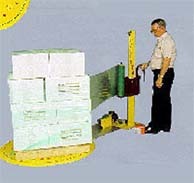 Use an automatic plastic wrapping machine with palletized product sitting on a turntable (Fig. 2). This ensures the employee will not have to bend at the waist to wrap the pallet. If manual wrapping must be performed, use rolls that weigh as little as possible to minimize the lifting hazard. A handle (Fig. 3) will prevent employees from placing their fingers into the tube, thus decreasing the risk of cuts. Keeping cool in the summertime is a full-time job in Texas. Friedrich Air Conditioning, San Antonio, TX, provides assistance in this endeavor by manufacturing self-contained commercial air-conditioners (AC) for various types of installations, including temporary construction sites and standalone school buildings, to name a few. The unique air-conditioning units are taller than Shaquille O'Neal'more than 7 ft'and weigh up to 490 lb, providing a new packaging challenge for Friedrich. The new air-conditioner line, the wall-mount series, was introduced in March, '00 and includes seven different models. Before this product introduction, Friedrich was packing smaller air-conditioning units in corrugated cases and did not own a stretch-wrapping machine. With help from distributor Pack-Mark, Inc., Friedrich bought an Orion FA-66 fully automatic, rotary turntable, conveyorized stretch-wrap system. The system features a 4,000-lb load weight capacity, a programmable logic controller (PLC) from Allen-Bradley, structural steel components and powered roller conveyors. With all of the units in the wall-mount product line weighing more than 200 lb, Ralph Fuentes, manufacturing engineer for the assembly line at Friedrich, needed a stretch wrapper that could convey the large air-conditioners to the wrapping station in a reliable manner. Fuentes says, "The main attraction to the system was the relative ease with which the stretch wrapper conveyed the wall-mount units. The motorized, powered rollers on the conveyor are very sturdy, and I really like that the operator is not getting involved with moving these units in the stretch-wrapping area." The air-conditioner, pictured at the top, measures 24 x 48 x 90 in. Orion customized the FA-66 with a 12-in. mast-height extension for wrapping the upper section of the tall units. Friedrich bought the machine in September, '01, but the stretch wrapper was not connected to infeed and outfeed conveyor lines at that time. In June, '02, the stretch wrapper was integrated with the infeed and outfeed conveyors. After the wall-mount air-conditioner unit undergoes final inspection (proper freon distribution within the unit), it is placed on a 25 x 48-in. wooden pallet. Due to the large size of the units, one resides on each pallet. From the inspection system, the air-conditioner rolls forward on a gravity-fed, metal-roller infeed conveyor to the first station on the packaging line, the corner-board application area. Here, an operator manually places double-wall, 200-lb corrugated corner boards around the four corners of the unit. Supplied by Gaylord Containers, the corner boards are affixed with tape to the 90-deg edges, providing protection during distribution. The unit moves forward on the infeed conveyor'manually moved forward'after placement of the corner boards and approaches the FA-66's motorized conveyor system. At this point, the infeed conveyor rises approximately 14 in. to meet the stretch wrapper's conveyor. The infeed conveyor tilts downward, and the pallet slides forward. From there, the conveyor moves the pallet to the wrapping station. At the stretch-wrapping station, the pallet is secured on the turntable. The film carriage, after being loaded with 70-ga polyethylene stretch film, moves vertically up and down a stainless-steel tower while the turntable rotates. The combination of these two actions creates the stretch wrapping action. The stretch film is supplied by AEP Industries. Friedrich's packaging line is able to stretch-wrap 20 to 30 units per day. The FA-66 comes equipped with Orion's Insta-Thread' film-delivery system. The system provides simple loading of film into the carriage by opening a hinge that guides the film tail through to the rollers. Also, the Insta-Thread system provides prestretching of film to 245 percent by using two textured rollers inside the delivery system to stretch the film, with one roller turning faster. This prestretching cuts film After wrapping, the film's tail is cut using an impulse hot-wire. The pallet then moves to an outfeed conveyor. usage costs. Friedrich uses 84 ft of film for each unit, PD is told. After the pallet is wrapped, it moves past a sensor that provides logistical information on the pallet to the PLC. From there, the wrapped pallet then travels 35 ft on an outfeed conveyor. At the end of the conveyor, a forklift operator picks up the unit and places it in storage. For this new product introduction, Friedrich needed this "lift" to keep up with the new demands placed on its packaging operations. While shopping around for a stretch-wrap system, Fuentes saw an Orion video of the FA-66 and knew immediately that the system was the one to purchase, PD is told. With this successful installation and operations running smoothly, Fuentes and Friedrich feel cool as a cucumber in the Texas heat. Growing a small Louisville business into an industry-dominating global enterprise might seem a stretch, but stretch is what it's all about at Lantech. The company pioneered using plastic film to wrap multipackage shipments into a tightly bound unit on a wooden pallet. Brothers Pat and Bill Lancaster developed the concept at a kitchen table using rubber bands to visualize how plastic film could be stretched around stacks of boxes. It was an almost immediate success. "It was such a better mousetrap," said Pat Lancaster, company chairman. "That's how a company with no money can get started." Today, Lantech has 420 employees, 60,000 machines in the field and annual revenue of about $110 million. The company has more than 175 patents in packaging machinery, holds the dominant share of stretch-wrap machinery sales in North America and has strong sales in Europe, Asia and Australia. "They are the best and everybody knows them, and they recognize how important they are to the industry," said Mark Matthews, vice president of marketing for packaging for Xpedx, a packaging equipment and supplies distributor. 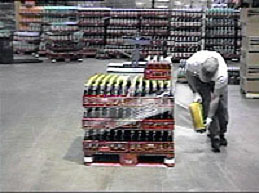 The technology that Lantech invented can be seen in almost any warehouse and in big-volume retailers such as Sam's Club. (WMT) Boxes, bags and other containers are "unitized" onto a pallet for fast loading with a forklift. About 80% of everything shipped arrives on pallets. And of that, 90% is bundled by stretch wrap, said Jim Lancaster, CEO and son of Pat Lancaster, who turned over the company reins in 1995 and now concentrates on research and development. Bill Lancaster sold his share in the1990s. Before the Lancasters developed their technique, shippers worked with large shrink-wrap bags, which were heated to seal the plastic, Jim Lancaster said. Lantech was founded in 1972 to make and sell the ovens needed for the shrink-wrap. But rising energy costs prompted the Lancasters to look for a different approach. With stretch wrap, they discovered, the plastic would stick to itself ' no heating required. Also, the new method was cheaper and required less plastic. At the time, strapping cost $2 to $5 per load, and shrink bags cost $1.35 to $1.40. Stretch wrapping a pallet load cost $1 or less then ' and today is 25 to 35 cents per pallet load. When the Lancasters made their discovery, shrink bags took 2 pounds of plastic to encase a loaded pallet. The first stretch machines cut that by half. The latest, out last year, can wrap a load of paper products with 3.5 ounces of film, and beverages with 4.5 ounces. Lantech introduced its machines at a trade show and "for the next four years, our only problem was figuring out how to make them fast enough," Pat Lancaster said. Lantech patented its stretch-wrap technique, but in 1989, a court stunned the company by voiding its primary patent. As royalty payments from other companies for using the technology dried up, it also became clear that production at Lantech's Louisville plant was ailing and it could lose out to competitors, Pat Lancaster said. In response, the company switched to the "just-in-time" production methods pioneered by Toyota, which lowered costs and raised quality and delivery speed. The improvements were dramatic, Pat Lancaster said. Innovation, quality and efficiency are "what allow us to stay competitive" when many manufacturers have shifted their work to low-wage nations, Jim Lancaster said. He added that the company's fastest-growing markets are China and Southeast Asia. How To Create Film Force? How To Control Film Feed? · A process that allows stretch film to be stretched before being applied. · The stretch film is prestretched by two rollers. The second rollers rotational speed is quicker than the first, thus stretching the film between them. Why Use Prestretch Stretch Film? By stretching the film, the tensile strength of the film increase so that it becomes drastically stronger. After the film is stretched it wants to return it to its original form. The more you use this prestretching process, the worst the film memory becomes. When the stretch film is applied to a load with no force to load, quickly it will be able to detect that the film has tightened due to its memory as it tries to return to it original size. Stretch film memory is what distinguishes stretch film from other means of packaging unitizing. Settling that can happen during shipment can loosen other methods of unitizing products. Stretch film memory takes up the slack and continues to secure the load during shipment. Your cost of stretch film is reduced when it is prestreched compared to stretch wrapping a load with film that has not been. Using just hand or machine to add tension to stretch film does not provide uniform stretch and is not able to have reliable performance. This type of stretching can lead to intermittent load failures. · When film is stretched mechanically between the film carriage rollers due to the gearing ratio and diameter of the rollers it is prestretched. · The stretch in the film produced by the film tension between the film carriage and the load being wrapped, which is also known as force to load. · If the film tension is increased the post stretch will be intensified. Maximizes load retention of the film. This "Tension" stretch is generally on the corners of a load, which can cause damage too high. · The amount of film force applied is directly proportional to Post stretch. · Increase film force and the post stretch will be increase. · The tension created in stretch film due to the films attempt to return to its original state after having been stretched. · Low film force restrains the film from returning back to its original state. · Film Force is formed by creating tension between the load and the film carriage that can be produced both mechanically and electrically. · Electrically reducing the speed of the film leaving the carriage compared to what the load requires increases the stretch film force which causes the film to stretch between the load and the carriage. · Mechanically postpones the dancer arm which measures the speed demand of the load will reduce the film feed leaving the carriage which increases the force. · Provide the stretch film required to wrap a load while keeping the tension of the film constant. · The carriage must vary the supply of film with the demand of the load while the load revolves. · A dancer roller reads the demand of the load. · SENSOR: The stretch wrappers dancer arm rotates a cam shaft which sends a varying signal to the drive board then it sends varying voltage to the motor. The larger the dancer size the larger the output voltage. The larger the output voltage means the faster the film is fed. Unitizing products with stretch film, greatly decreases handling costs. Handling of individual boxes is more time consuming than handling a unitized load. Another benefit of unitization packaged goods is the amount of man hours saved in the movement and shipment. Unitizing packaged goods increases the speed at which they are moved, carrier vehicles spend less time at docks. This time saved also offers valuable cost savings. Reduce the risk of pilferage and theft because packages are in a enclosed load and are complicated to remove. The loss of packaged goods is much easier to keep track of if they are shipped out in unit loads rather than individually, which reduces the occurrences of lost or stolen items. Stretch Film wrapped goods moved by forklift or pallet jack, are less likely to substain damage than loose boxes carried by hand. Moving a unitized load in a warehouse reduces the risk of product damage. It is less likely in shipping that dense and or heavy items will be packed on top of palletized unit loads. You stand a greater chance of not being damaged because of this. Unitizing products speeds up control of inventory since large unitized loads can be recognized, counted and managed more easily and individual boxes. Unitizing products and goods for your customers allows them to offload and move goods through their warehouse more efficiently. Quick Guide! Stretch wrap is perfect for picture frames, stereos, speakers, TV's, furniture and other sensitive items. Stretch wrap keep sensitive product dust free and also provide a cushioning to breakable items!